Deputy Speaker 8th KLA from 02-04-1987 to 05-04-1991. 8th KLA [Kilimannoor–(SC)-CPI], 10th KLA [Kilimannoor– SC-CPI]. Daughter of Shri K. Easwaran and Smt. K. Kutty; born on 24 July 1942; Husband : A. K. Thankappan; 1 Son, 2 Daughters. 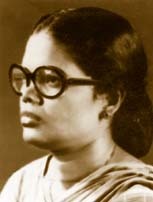 Member, Kerala University Senate, CPI Thiruvananthapuram District Executive Committee; CPI State Council, CPI National Council; Vice President, Kerala State Karshaka Thozhilali Federation, Kerala State Kasuvandi Thozhilali Kendra Council; Joint Secretary, National Federation of Indian Woman; General Secretary, Kerala Mahila Sanghom. Publications : " Danyubinte Theerangaliloode" (Travalogue).